I just moved into a new apartment, and my mom was here this weekend helping set everything up. We spent a couple days shopping for new things, and she spent $200 on this chair to go in my office area. 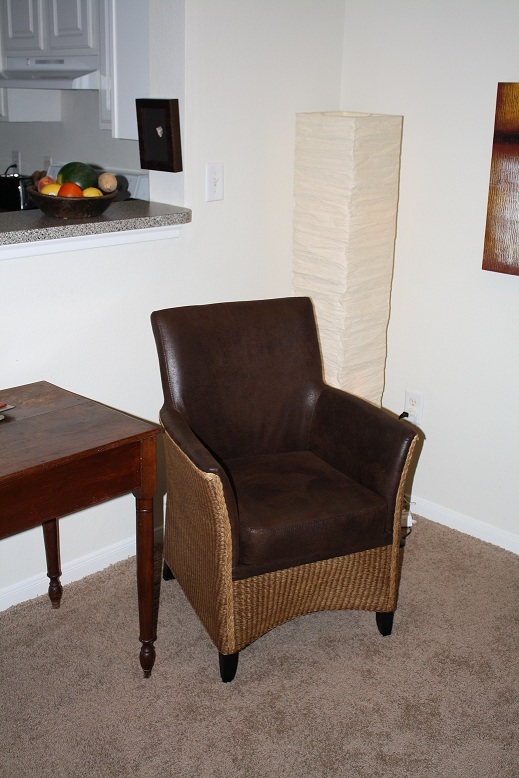 I was never crazy about the chair, but thought it would grow on me… But it hasn’t. So now I’m caught in this trap of asking her for the receipt without hurting her feelings. Which was producing a lots of fear in me, which I had just read about in the course. Specifically Chapter 2, section VI. “Fear and Conflict”. The phrase personally responsible really struck me here. It made me really think about how I’m trying to control the situation with the chair. And then it struck me, in the course they are always talking about how God created us in his image, so we create our world in the same way. When we create our world together with the divine everything is groovy. When we separate ourselves and try to create the world on our own, that’s were fear originates. We are trying to be gods of our own little worlds, but without God’s help. That’s what I was doing with my mom. Trying to be the god of that situation. To control the conversation, to control her response, to control the outcome. It’s like in the very act of trying to control the situation, that’s what removes control. The only way to truly be in control is to be present, to be synced up with the divine. To be creating in lockstep with it. In this, there is no fear. I’m no longer tied to the outcome. I know if I’m connected with the divine, it will undoubtedly be in the highest good. This entry was posted in A Course in Miracles and tagged A Course in Miracles, awareness, conflict, fear, fear and conflict, personally responsible by Kelly. Bookmark the permalink.